On 22nd July Xiaomi entered the Indian market with its Mi 3 smartphone through Flipkart and as the company has fared in China the same could be seen here as the company has claimed that Mi 3 was “Sold out in 38 mins and 40 secs” to be precise. The company has tweeted saying “Thanks for the overwhelming support! We are working hand in hand with Flipkart to improve your buying experience”. 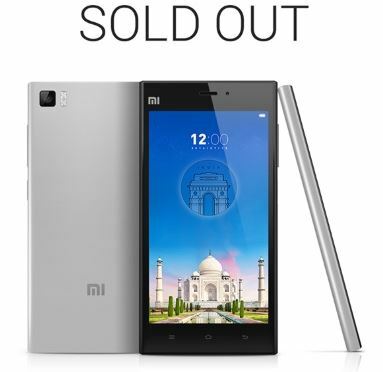 The smartphone went into sale at 12pm IST on 22nd July and Xiaomi tweeted one hour after the finish of sale. On Monday Xiaomi has said that it had received 100,000 registrations for the Tuesday release, but did not give an exact number on the sale which happened on Tuesday. With the release of Xiaomi Mi 4 taking place on the same day in China there is a huge buzz in the smartphone market about the presence of the China’s Apple company in India and around the world. Xiaomi Mi 3 has a 5-inch full- HD display (1080×1920 pixels) with 441 ppi running on 2GB of RAM and 2.3 GHz quadcore Qualcomm Snapdragon processor. It has a Adreno 330 GPU which is run by 3050 mAh battery and Internal Storage of 16 GB. It has a 2 MP front facing camera and 8 MP rear facing camera. Xiaomi Mi 3 runs on MIUI 5 which is a highly tweaked version of Android 4.4 which is pretty neat and the company has been giving regular updates of its MIUI OS and will also be giving updates is what the company has said. Xiaomi has also launched a budget smartband and fitness tracker called the Mi Band which is being priced at $13 which is around Rs. 800 INR and this is the cheapest smartband in the market for now. Xiaomi has not just kept it low end pricing with high end features to smratphones but is also entering the emerging wearables market.